We believe that no structure that is not cohesive with the environment and disrupts the ecosystem of the place should ever be erected. The world is in dire need of eco-projects and we stick by their rules. In fact, our resources and our services are all so fashioned that we do minimal damage to the natural surroundings. PaverCrafters Inc. has been around for 20 odd years. Sustainability is a big priority for us and we look for manufacturers who follow the same principles. Hanson Hardscapes is one of our biggest suppliers of eco-friendly hardscape products. Pavers often form an impermeable boundary between the surface which collects rain water and the ground which needs it. Hanson Hardscape’s Aquaflow pavers are a wonderful solution to the stormwater runoff that is a problem with conventional paving solutions. Aquaflow is an eco-friendly, environmentally sensitive, Sustainable Urban Drainage System (SUDS) that helps in replenishing ground water levels. It is affordable and has an attractive and durable surface. Be it public spaces and residential and commercial sites, paving of any of these properties lead to rainwater runoff. Innovative techniques are needed to combat these problems and make for a greener, healthier society. We have been certified by ICPI as a Permeable Interlocking Concrete Pavement (PICP) installer. The PICP consists of layers of concrete pavers alternating with layers of small crushed stones. 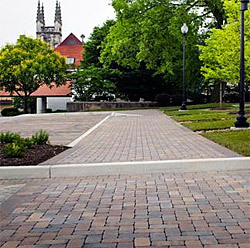 Concrete is highly porous and along with the loose layer of stones, these environmental pavers are perfect conduits of rainwater from the surface to the ground. The pockets between the stone allow complete and easy permeability of water while the base filters the water and strains pollutants to allow pure water to seep back into the groundwater reserves. While concrete pavers serve as porous channels of rainwater, brick pavers of Belgard are also equally environmentally safe. The landscapes, retaining walls and patio build with Belgards collection of eco-friendly paving stones your property will look chic and do much good to the surrounding environment. 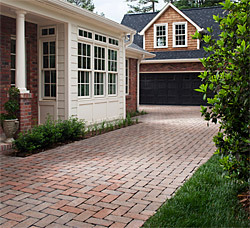 These paving stone installations can make for an attractive driveway with the multitude of shapes, color and textures. Contemporary styles and old world charm- this amalgamation is perfected by Belgards in an environmentally sustainable form. We have done a number of installations using this collection that is available on display on our website. If you are planning an eco-friendly park or garden, you can just give us a call at 727 573 7883. We have eco-friendly paving solutions for commercial and residential hardscapes. We would be glad to give your idea a more concrete shape. You can also request a free quote by filling the online form. If you want to get a better idea of our work, come visit us in our 5000 sq. ft. showroom to look at samples of our work and resources. You can also contact us online through our website or mail at info@pavercrafters.com. We provide services and paving solutions to cities like Dunedin, Clearwater, Tampa and St. Petersburg.